Barbara asks:The opposition of Jupiter and Saturn. Both opposites in meaning, and the natal opposition compounds that. How would that karma unfold? I have read so many interpretations, but I value your interpretation. 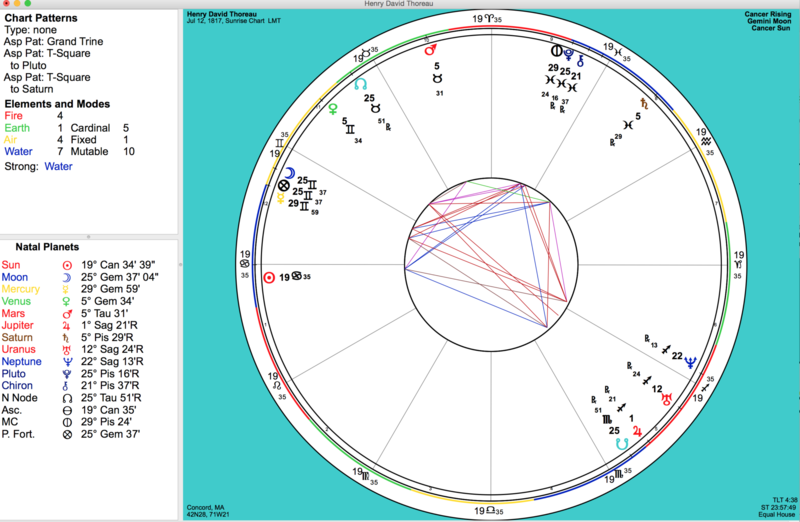 Ron Watson replies:Barbara, in my opinion, the opposition of Jupiter and Saturn represents a battle between the polar opposites of optimism and pessimism, of emotional conflict that at it’s worst is manic/depressive. The highest and the lowest. Sort of reminds me of Jesus/Satan battle and in fact they are the chief archetype for these two planets, when scriptures states: “what is it that he ascended, but that he first descended into hell”. I find people with this aspect often go through a spiritual catharsis in their battle with depression and darkness (saturn) and their search for the light and faith (Jupiter). It’s a constant battle between faith and despair. Thoreau, the great poet wrote: “most men live lives of quiet desperation and go to the grave with the song still in them” After quoting Thoreau I decided to look at his chart to see if he has an affliction between Jupiter and Saturn and NOT to my surprise he has a nearly exact square between them with an opposition between Saturn and Venus. . I also want to point out the rule I generally see with Jupiter/Saturn afflictions is that Jupiter (Jesus) wherever it is crucified (afflicted) will almost inevitably resurrect from that cross to a very positive outcome. I know you have that aspect of opposition as does other students in the class have afflictions between these two planets. Jupiter will always manifest it’s highest amount of light and hope in the darkest moments. that is what distinguishes it being afflicted from others. The manifestation of Jupiter’s resurrecting power can only come with the enlightenment of the message of faith which is the faith of the saints, which is total faith in God (good) despite the appearance to the contrary that Saturn (satan) would have you accept, and the exercise of that faith which proclaims ‘all things work together for G0OD for them that Love God. Jupiter works best when embraced in total darkness and despair for then it’s light works most powerfully by contrast.